Founded in September 2002, Sal’s Realm of RuneScape is a fansite devoted to RuneScape, an online multiplayer game. We seek to provide noteworthy tips, detailed guides, and easy-to-use tools that players of all levels will appreciate. One of the most distinguished features of the entire RuneScape gaming community is its cooperative and enthusiastic spirit. Players are always learning new things from their gaming experiences, and sharing these discoveries with the rest of the gaming community. Our guides and other resources are written by RuneScape players from all corners of the world, and we put an emphasis on quality and thoroughness into every piece of content we publish. Are you curious about how Sal's Realm began? Would you like to know more about our past? If so, you're in the right place! Below you'll find a timeline of the major historical events which make up the history of Sal's Realm. Sal’s Realm of RuneScape is founded by a RuneScape player called "Salmoneus," with the purpose of helping other RuneScape players by providing helpful, detailed, and well-written guides. Our first website redesign goes live. The original background colors were two different shades of gray. With the redesign, we changed to a marble-stone-texture background for the main page, and a paper-textured background for the left navigation. Second site redesign goes live, after feedback from users. Our previous marble-and-paper design becomes a more simple gray-on-blue design, to make our website easier to read. Community discussion forums opened on InvisionFree. First skill calculators went online. Community forums are migrated to our own server to provide more features and options to help our community to grow further. Old forums are closed. The SalCast podcast is launched, featuring interviews, discussions, music and more. The Sal's Realm Newspaper goes live, featuring various content written by our community members including interviews, news, comics, and riddles. First “official” contact with Jagex about becoming a supported fansite. Officially recognized by Jagex as an official, platinum-level, RuneScape helpsite/fansite. Sal's Realm announces our partnership with RuneWise. The Sal's Realm Clan Citadel is officially opened to all RuneScape players. 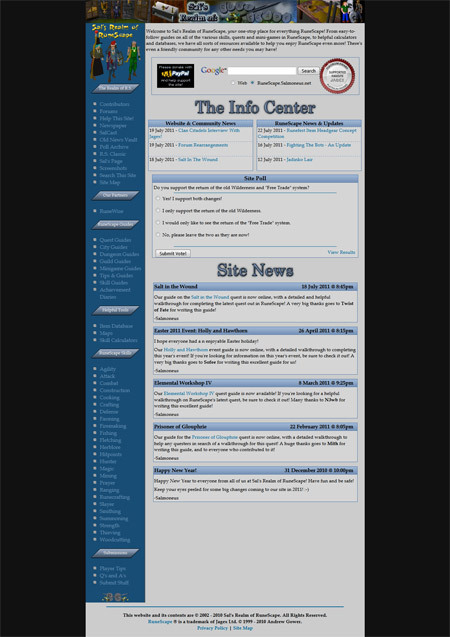 Third redesign (version 4 of Sal's Realm) of the website goes live. This is the current look of our website.